Nova Campground is the perfect home-base for anyone looking for adventure. Come explore with us -- we promise you'll fall in love! Duh! You can't come to the city that's home to The World's Most Famous beach without actually going to the beach. Our campground is less than 10 miles from countless local and tourist spots. The Atlantic Ocean is never more than a quick car (or bike!) ride away, so pack your sunscreen and towels to soak up some fun in the sun! Perfect for family, friends, thrill seekers, and anyone who loves to have a good time! The city's famous boardwalk features fun in the form of thrill rides, souvenir shops, snack bars, restaurants, an arcade, and more! Pro-Tip: Face your fears and brave the “Slingshot” - the thrilling main attraction that propels riders 365-feet into the air at 70 mph. Good luck! This family owned and operated restaurant has been a local staple for more than 30 years. Sitting right on the Halifax River, Aunt Catfish boasts killer views, friendly staff, and THE BEST food -- seafood or otherwise -- in town. Famous for their cinnamon rolls, which they make fresh, daily, in-house, and their crazy wait times (sometimes a few hours long), it's impossible to deny the cultural impact this mom & pop restaurant continues to have in the sleepy town of Port Orange, Florida. Pro-Tip: Come hungry, but not too hungry. As mentioned, wait times can sometimes get to upwards of two hours (especially on Sundays when the people come out in droves for the infamous Sunday Brunch Buffet). There's a bar in the hostess / waiting area if you fancy a drink in a Mason Jar, and an outdoor deck with views and occasional live music. What better way to cool off in the blistering Florida heat than making a splash at the best water park and arcade in town? Daytona Lagoon is Daytona Beach's premier water park and family entertainment park. 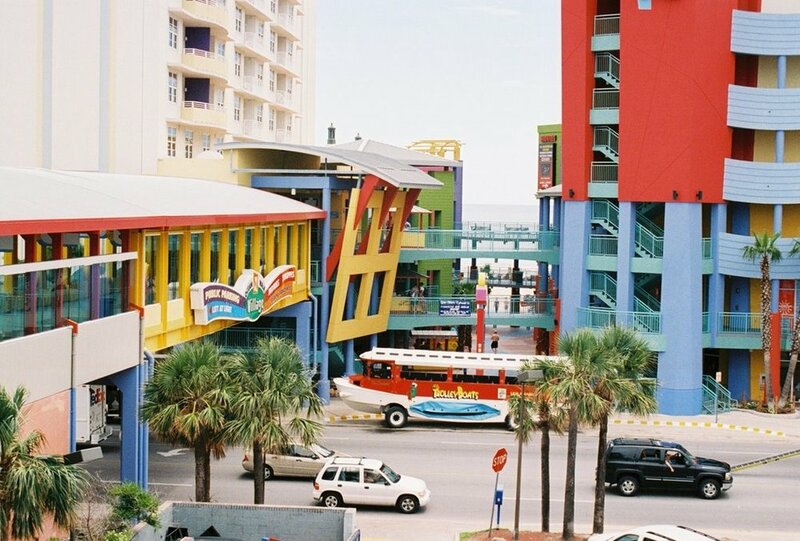 Located adjacent to the Ocean Walk Shoppes and in the midst of some of Daytona Beach's most famous streets, the Lagoon has rides for all thrill-levels (including a wave pool, lazy river, kid-friendly activity center, and multiple unique slides! ), a full service bar for the 21+ guests, and plenty of shade for all! Need some AC? No problem! Head inside to the arcade and try your luck on the rock wall or playing laser tag. Pro-Tip: Don't forget about mini-golf, go-karting, and the super-suspenseful sky maze! 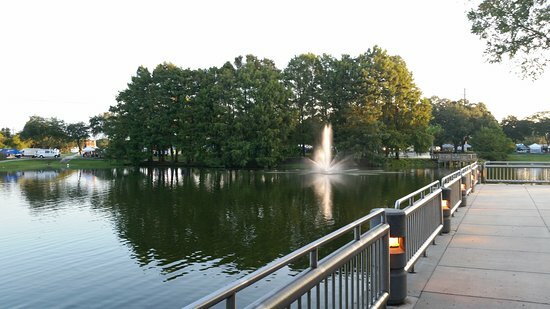 "Riverwalk Park is split into two sections bordering the Riverside Pavilion on the Halifax River. The north section includes a kayak/canoe/paddleboard launch, a new boardwalk, 12' wide trail, concession stand, and restroom facility. The south section includes a splash pad, playground, event lawn, concession stand, restrooms, and a 12' trailway. The facility is available for rental for private parties and public events." This open-air shopping mall is literally steps away from the sands of Daytona Beach. Grab ice cream at Cold Stone Creamery, take in a flick at the theater, then finish with a nightcap at the Mai Tai Bar! The beach is a sight to see at night and perfect for a romantic stroll after a date. With so much to see and do, you might need two days here! 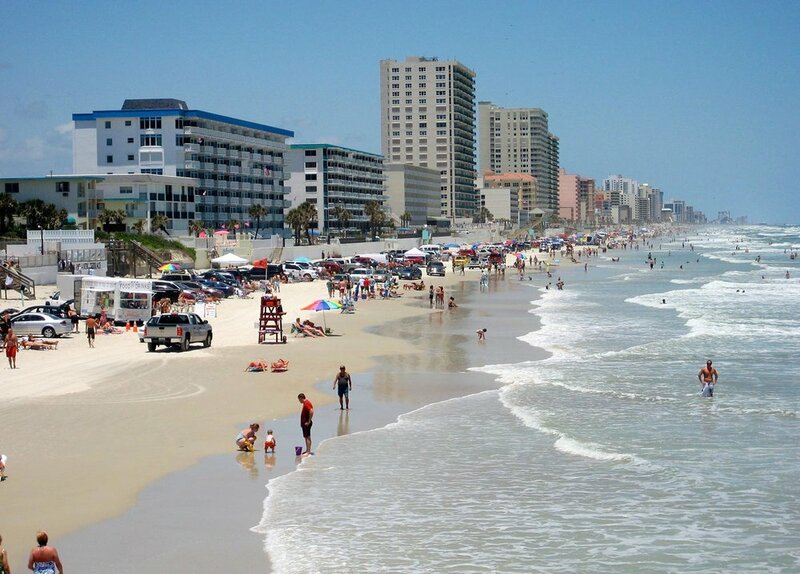 Ocean Walk eats: Bubba Gump Shrimp Company, Cold Stone Creamery, Ker's WingHouse, Johnny Rockets, Mai Tai Bar & more. This shopping center is mere miles and just a short car ride (~5 minutes) away from our park! The Pavilion is fairly new (built less than 10 years ago) and is a beautiful property to take in a stroll, get some shopping done, grab a drink or bite to eat, or watch the latest Hollywood movie at the Hollywood Theater! Pro-Tip: Tuesday nights is Senior Night at the theater. Pop in for discounted tickets and then sit back with a bucket 'o popcorn -- treat yo'self! Fancy a walk? You're in luck! The Port Orange City Center is less than a mile away from Nova Family Campground. Take a stroll or ride your bike to the Center for a relaxing day outside. Get some steps in while you walk the 1/2 mile loop around the lake or get lost in the local library (which also has an impressive catalog of CDs, magazines, films and TV shows on DVD, and much more). "Built in 1937, this scenic amphitheater is located in Oceanfront Park on the north end of the Boardwalk amusement area and overlooks the Atlantic Ocean. It hosts concerts May through September that feature jazz, Dixieland, big band, folk, rhythm and blues, tribute bands and contemporary. 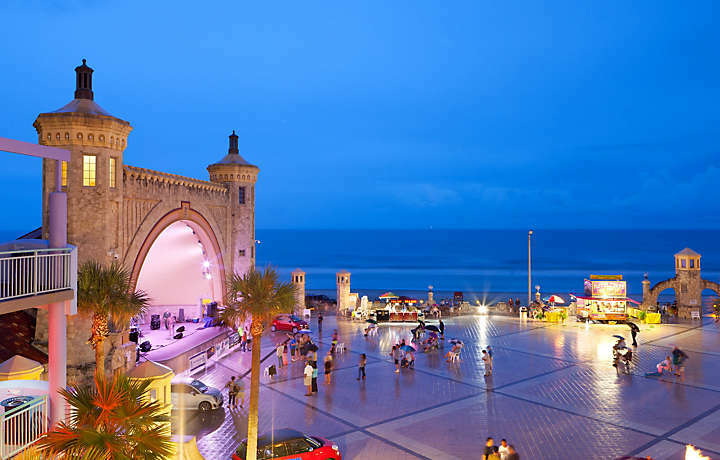 The Daytona Beach Bandshell can also host 5,000 people for events, group activities, outdoor weddings and receptions." Pro-Tip: Come to the Ocean Walk Shoppes even when there aren't events going on and grab a drink at the adjacent Mai Tai Bar, which hosts a fantastic view of the venue and, right behind it, the expansive Atlantic Ocean. What's a beach without salty waves? And what are salty waves without surfers, fisher(wo)men, and tanning bodies? Crabby Joe's and Sunglow Pier has been around since the 60's and doesn't seem to be going anywhere or dwindling in popularity anytime soon. A local gem, this restaurant / pier duo is the place to see and be seen. Young folks flock to the beach to tan and hang out with friends, while surf-junkies paddle past the pier to catch some of the best waves the city has to offer. For a small fee, you can cast a line off the back of the pier and even clean your catch right on one of Sunglow's many cleaning stations. Oh, and we forgot to mention, the restaurant and drinks at Crabby's ain't half bad, either! No trip to Florida is complete without a life-changing trip to the world famous Walt Disney's Magic Kingdom. This attraction barely needs an introduction and even fewer words to describe the most recognizable theme park in the world. Orlando is just an hour's drive from Nova Campground, and we highly recommend making the short journey to enjoy the experience of a lifetime. No one does it quite like Disney! (and we challenge you not to shed a tear at the sheer beauty and majesticness of it all!). And, if you've already been fortunate enough to visit the Magic Kingdom in all its glory, you've still got Harry Potter World, Islands of Adventure, and Universal Studios theme parks to check off your list! Bonus: Come during October and get your haunted house on at the annual Halloween Horror Nights at Universal Studios, Orlando.